Hi guys, I bought my Parker PDF105 QBB in June this year, and i can say there's an addition of small (and big) quality issues with their guitars. Below is the e-mails I sent to the online shop I bought it from. 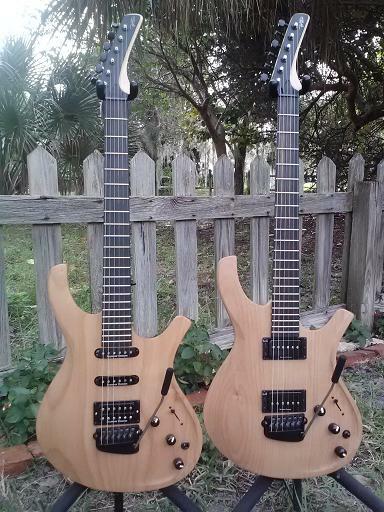 "The fretboard wood is gorgeous. The neck or the frets are awful, E,A and D strings buzz almost all along the neck! The piezo system doesn't function, the 3-way switch (mag PUs, mag/piezo blend, piezo only) is more of a mag/ same mag/kill switch"
I later found out that the battery was dead. I exchanged the guitar, the second was OK, but still stupid glitches here and there. "There are light scratches on the neck, close to the headstock, a little dent further up the neck towards the e string, and a small chip of wood is missing at the bottom end of the fretboard. Nothing that will impact playability but it's just disappointing on a brand new guitar. The frets are just fine (even the fret edges, which didn't feel as smooth on the first one) and the fretboard is nice smooth and shiny, feels great. And the good thing is this one has got a battery that's actually got juice in it, so the piezo should work. I only thought about checking both batteries tonight. And the first one was flat - another stupid easy to fix thing again. But come on, they (and you) should pay attention to that, it's a selling feature of this guitar, at least why I bought it, this and the Duncan pickups. 2nd thing. The hex wrench to adjust action slips in the screw heads, they don't turn. So I'll have to find a slightly larger wrench if i want to adjust this, hoping I won't need to replace the screws themselves. The 3rd one is really minor but is another bad example. The gigbag handles are not assembled identically on the 2 gigbags. The first one was ok, with the wrap-around velcro thing wrapping around both handles. On the second one, that wrap-around is sewn on top of a handle, so it's higher and doesn't tighten well. Once again, I've only had Asian import guitars a Cort bass, an Ibanez bass and a cheap Ibanez dreadnaught, and an Epiphone. I've got a LAG guitar made in Korea now, and never had such issues, so it's not about being an import it's about the Parker shop. I hope their 4000$ US made line is not as bad." And now since a few days, the Mag PU switch (Neck, Both, Bridge) cracks when I use it, and the Mag/Piezo switch is faulty. When I want piezo only it either gives me Mag+Piezo or nothing. I have to wiggle it gently so it "locks" in the desired position. Maybe it's the battery again... I opened the back cover, I'm no expert but the soldering looked quite bad. So I'm taking my axe to my local guitar tech so he fixes the wiring and switches. Quite sad for a 6 months old guitar...And 2 guitars shipped from Parker, 2 guitars with issues. While it's in the tech's hands, I'm also mounting Triple Shots from Seymour Duncan, so I can finally have coil splitting and other options without making the wiring awfully complicated and without drilling extra holes. I also heard that Parker was going to discontinue their PDF line... due to recurring quality issues. It would seem that they can't find any supplier able to ship out good quality at the required cost (which is certainly also why you don't have coil split as standard on piezo equipped models). Did you have similar experience or was it just tough luck for me ? I can't really say, but it sounds like you're aware that the PDF series are manufactured in Asia. That isn't necessarily bad, but it means that the actual Parker factory team probably won't even see or handle those guitars in any way when an order goes through. In any case, ordinary setup issues (not manufacturing defects) are supposed to be handled by the vendor you purchase from, so there's another point of possible failure. On a side note, I have not bought a new guitar for myself since I was about 14 years old. It has worked out well for me to buy used and perform my own setups and repairs, if necessary. Did that with my Deluxe too. Assuming you spent about $900 on the PDF105, you could have picked up a lightly used Deluxe for not much more, and perhaps would have had a better experience. Thanks for sharing your experience, erwann! The USA guitars are not immune from bad hardware, either, and it strikes me as odd that I can get Ibanez and Sterling by Music Man imports that seem to be at a more consistent quality level for a lower cost. Unfortunately, the other brands don't have the features I want/need without extensive modification or I would have switched. I am kind of underwhelmed by my PDF105 (there is no amazing tone, like my previous Parker had, to offset the quality issues) but it remains "useful." Hopefully, an upgrade in pickups and doing modifications like you're planning will raise my appreciation for it. Had I the luxury of time at the moment of purchasing the PDF105, I would have elected to get a used Mojo Fly or Nitefly; sadly, needing a guitar "right now" and taking advantage of two-day shipping was more paramount. Don't get me wrong, the PDF105 is "worth" the money I spent; I just don't get all excited to play it like I did my Fly Mojo Singlecut. The pdf 105 was the perfect choice, versatile because of the piezo, Duncan pickups, locking tuners etc. Apart from these issues I mentioned above, I'm very happy about the sound of this guitar. The benchmark is playing it "unplugged", and it's quite loud and clear with good sustain and balanced tone. Amped up, it's very good too with a deep, rich neck tone, a punchy, bitey bridge tone that' great for crunches to medium-high distortion (not a death metal core djent player anyways :-), throw in the piezo and the possible combinations and volume mixes it's really an all-rounder, been more so with the triple shots that I'm installing very soon. The wood quality is as good as you can get in that price range I'd say, but the assembly is so-so. I had a LesPaul Epiphone and was playing only acoustic for the past few years, the neck felt really thin-almost too thin- but I got used to it really quick. it's really comfortable to play, and I'd say I've never played this well (but I'm an eternal beginner) or this much since I've got my pdf. 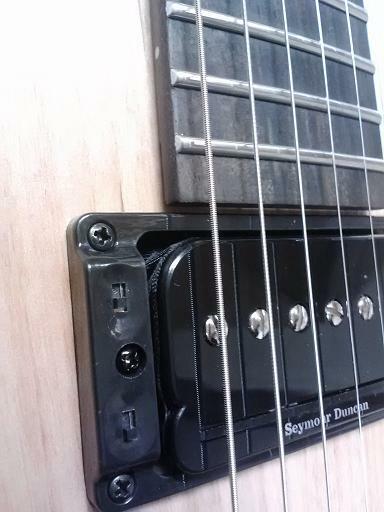 Once I've got my amp (eying a HotRod deluxe 3 with Jensen cab) I'll probably then switch pickups to Duncan P-rails. That should be even more versatile, without going to some of the extreme wirings you can see on some forums. I have also been considering the PDF105 and the DF524. I don't like the fact the 105 does not have push pull switch and your information on the problems you have had certainly would make one reconsider. I have read other reports of problems with these guitars. I understand while any guitar can have problems the US made guitars have a more consistent quality. Also, it would seem that the more expensive DF524 is a much higher grade instrument than the PDF105. Now the question is how much would I notice. I had a P38 some years ago and had a problem with the Piezo pickups; however, I sent it back to the factory and they repaired the problem at no cost. They also include a free gig bag with it on its return. There were no further problems at least not until I sold it a few years later. I am primarily looking at Parker because I like the very thin necks but just dont know if I am willing to spend that much money on a guitar. I currently play a American Fender Strat deluxe and like it okay. I just want something different. Now the question is how much would I notice. My USA Parker would have been "flawless" had they not sourced pots that failed. My PDF105 has actual fit and finish issues. Also, though it may not be the case with a DF5xx series, my full carbon Parker was so much more toneful than the PDF105 is. I would prefer the full carbon Parker but that is a lot more than I can afford. I am sure they are fine guitars. It is too bad there are not more dealers who handle these guitar. I would love to be able to play one before I bought it. I looked in Houston and could only find the imported guitars. No one carried any of the US made Parkers. I'm absolutely delighted with it, and it's worth every penny I paid for it. There isn't a bad or mediocre sound coming out of the guitar. And a little mixing of the piezo with some of the mag sounds gives me tones like nothing else. I've never had a desire to get a full carbon Parker - although I am absolutely sure they are everything everybody says about them. It's just that (1) I like the feel of wood and (2) In my current gigging situation I play sax, wind synth, flute, vocals, guitar and percussion controller - so I can't really justify the cost of a full carbon Parker. I have two DFs, the original DF524NS and the custom DF522NN (it has the P-Rails). The 524 stays home for practicing and the 522 is my gigging guitar. The P-Rails are like the Swiss Army Knife of the guitar and I can get every kind of tone I need for our gigs with it. Plus as most Parker owners know, the Parkers are so easy to play, it's almost like we are cheating. BTW: I had one problem with my PD524, and I doubt that there was anything Parker could do about a piece of wood that had a fault in it and eventually cracked. But even though the guitar was out of warranty, Parker did the right thing and all is well. The customer service was fast and exceeded my expectations. That gave me enough confidence in the company to have them build me the second DF, my custom job. I had the trple shots mounted, for the little time I could test them before going on a business trip, they're pretty awesome. The sounds are very good, although I could hear more of a differece between series/parallel than between single/humbucker. On the amp side, I got a relatively good deal on a used Line 6 DT25. It's very versatile and goes great with my POD HD500x. When I get the P-rails in, that's gonna get me a veeery versatile set-up !